The Granola Chronicles: a monday meal. What do you know?! Here's another pasta recipe! Although I hate to even call this a "recipe" because it's so simple. In fact, I won't be posting a traditional recipe, just a little summary of the meal. Seriously, quick meals like this are my absolute favorite. They're particularly wonderful on Monday evenings when you're easing back into weeknight cooking. Really, you could use just about any vegetable, but I used zucchini this time around. To serve two: boil water in a medium sauce pan and cook 2 cups of dry pasta according to the directions on the package. 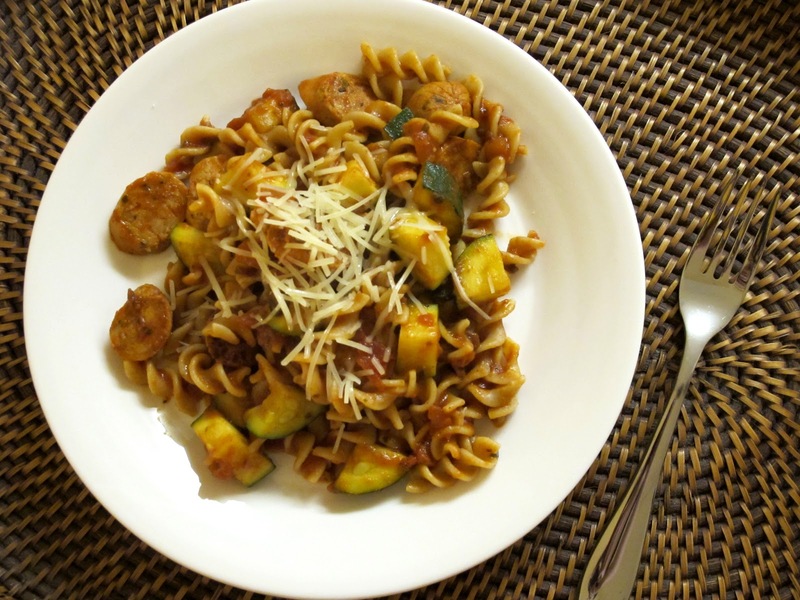 In a skillet, you'll brown two links of sliced chicken sausage - adding in one chopped zucchini for the last few minutes of cooking. After you drain the pasta, add it to the chicken and zucchini. Pour in one cup of pasta sauce and 1/4 teaspoon of red pepper flakes. Top with parmesan cheese. That's what I call dinner.